The St. Baldrick�s Foundation is a volunteer-driven charity committed to funding the most promising research to find cures for childhood cancers and give survivors long and healthy lives. � What began as a challenge between friends in 2000 has grown into the world�s largest volunteer-driven fundraising opportunity benefiting childhood cancer research. � Since 2000, more than 141 million USD has been raised for childhood cancer research, including more than 22 million USD raised so far in 2012. � The St. Baldrick�s Foundation funds more in childhood cancer research grants than any organization except the U.S. government. 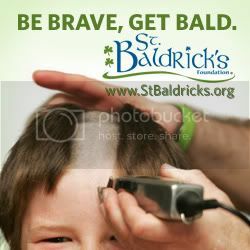 � In 2011, St. Baldrick�s awarded more than 21 million USD in grants. � Childhood cancer kills more children than any other disease � more than AIDS, Asthma, diabetes, cystic fibrosis and congenital anomalies, combined. � One in five children diagnosed with cancer will not survive. � Two-thirds of childhood cancer patients will have a long lasting chronic condition from the very treatment that helped save their lives. � Currently, childhood cancer research funding accounts for less than 4% of all cancer research funding allotted by the federal government. � Worldwide, more than 160,000 children are diagnosed with childhood cancer each year. � A child is diagnosed every 3� minutes with cancer. The St. Baldrick�s Foundation coordinates worldwide signature head-shaving events where volunteers get bald to stand in solidarity with kids with cancer and raise money to support life-saving childhood cancer research. � From 2000 to 2012, more than 237,000 shavees, including over 23,000 women, have shaved their heads at more than 5,400 St. Baldrick�s events worldwide. � In 2011, more than 1,000 events were held and more than 45,300 volunteers, including over 5,200 women, shaved their heads - the most in St. Baldrick�s history. � So far in 2012, more than 1,100 events and 46,000 shavees, including over 5,700 women, have registered on the Foundation�s website. � The Foundation has committed more than 78 million USD to life-saving research since 2005. � St. Baldrick�s donors and volunteers made possible more than 21 million USD in funding for childhood cancer research in 2011. � In addition to funding the research of pediatric cancer experts, St. Baldrick�s also helps make it possible for the best and brightest young doctors to pursue childhood cancer research. � The Foundation funds local institutions as well as cooperative research on a national scale to help doctors work together to develop the best treatments for all children with cancer. Applications from childhood cancer researchers are reviewed and rated by the Foundation�s panel of expert scientific advisors, who make funding recommendations. Final decisions are made by the Foundation�s board of directors. Supportive Care Research Grants will lead to the improvement of the quality of life for patients and survivors. This research addresses the side effects of treatment, long-term effects faced by survivors, psychosocial aspects of childhood cancer and more. Cooperative Research Grants fund the clinical trials and laboratories of the 200-member Children�s Oncology Group. Through this grant, the St. Baldrick�s Foundation funds virtually every institution in North America with the expertise to treat childhood cancers. Consortium Research Grants are granted to a group of researchers at multiple institutions. This new funding category was created to fund more researchers who are banding together to work on exciting projects with great promise. St. Baldrick�s Scholars are young professionals pursuing exciting research, funded for three years or more. Because grant funds are so scarce, it is difficult for those early in their careers to compete with more established researchers. These grants keep new researchers focused on childhood cancer. St. Baldrick�s Fellows are new doctors training to specialize in pediatric oncology research, funded for two to three years. St. Baldrick�s Summer Fellows work in a pediatric oncology research lab for the summer after their first year of medical school. Students accomplish a research project and the experience may encourage them to choose childhood cancer research as a specialty. Foreign Beneficiaries receive funds raised by St. Baldrick�s events held in their countries. Adolescents & Young Adults - Progress in curing adolescents and young adults with childhood cancers is lagging far behind the progress made in treating younger children. St. Baldrick�s places high importance on research to bring more hope to adolescents and young adults fighting cancer. Survivorship � More than 30% of survivors have a serious medical condition and or disability as a direct result of their treatments. The St. Baldrick�s Foundation has always funded grants that address these issues and will continue to do so. Supportive Care Research - More research is needed on symptom management, quality of life issues, family coping skills, compliance with therapy, and other areas of supportive care for childhood cancer patients. This focus area came as a direct result of the St. Baldrick�s 2010 Research Priorities Summit. The St. Baldrick�s Foundation holds the Better Business Bureau�s seal of approval and is accredited by the BBB�s Wise Giving Alliance. Charity rating agencies recommend that overall fundraising costs per dollar raised be kept to less than 35%; special events often cost as much as 50% of funds raised. Our fundraising cost in this fiscal year was a healthy 16%, and we strive to be more efficient each year. The Foundation�s audited financials are for a fiscal year of July 1 � June 30 and are available at StBaldricks.org. The St. Baldrick�s Foundation is a 501(c) 3 non-profit organization. Federal ID #20-1173824.